Got Enhanced Meat? USDA Rule May Make It Easier To Tell : Shots - Health News About 30 percent of poultry, 15 percent of beef, and 90 percent of pork are injected with some kind of liquid enhancement before sale, USDA says, and it's usually something high in sodium. Yet consumers are often unaware that a solution has been added. USDA meat labeling rule may make it easier to tell if your meat's been treated with a saline solution. Ever had that roasted chicken or your favorite pork shoulder recipe turn out much saltier than you expected? You're not alone. 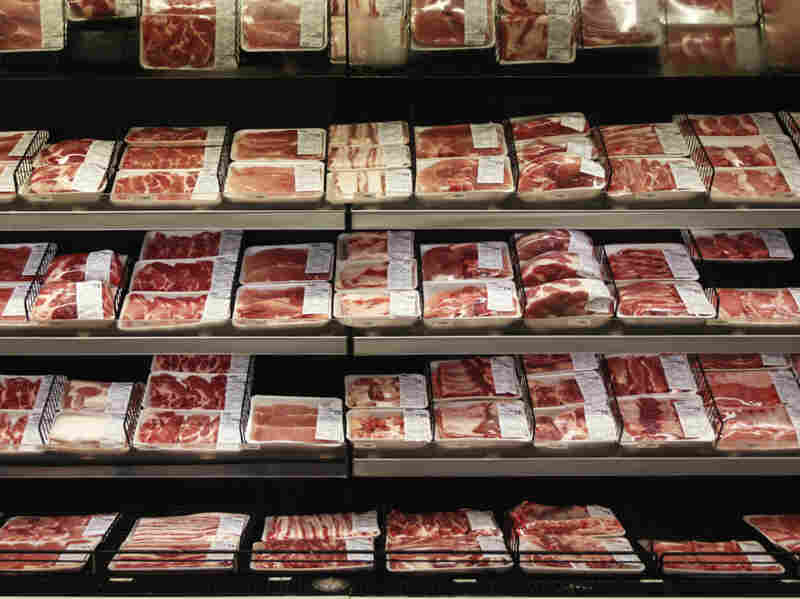 After years of getting consumer complaints about it, yesterday the U.S. Department of Agriculture announced it will soon release a rule that would make it clear — right on the label — that some meat products have been enhanced with sodium solutions. It would require the product's name to contain an accurate description, amount and ingredients list for the additive. So for example, a new name for an enhanced chicken breast would be "chicken breast – 40% added solution of water and teriyaki sauce," USDA says. It turns out that a lot of our meat is enhanced. About 30 percent of poultry, 15 percent of beef, and 90 percent of pork are injected with some kind of liquid solution before sale, USDA says, and it's usually something high in sodium. The solution pumps up the meat's volume and can "replace the flavor and moisture loss that results from raising leaner animals or from potential overcooking," says the American Meat Institute. "...[T]he Agency has tentatively concluded that without specific, clear, and conspicuous information about the percentage of added solution incorporated into the product, the labeling of these raw meat or poultry products ... is likely to be misleading to consumers." In English, that means consumers have a hard time telling whether meat's been treated. To be fair, the current rules already require disclosure, but consumers don't notice it, according to USDA studies. Poultry and meat injected with a salt-water solution can have more than five times as much sodium as what's naturally in those foods, says the Center for Science in the Public Interest, who petitioned the USDA in 2007 to improve the regulations. And that can be a problem for people who need to lower their salt intake. "Better labeling would help consumers concerned about high blood pressure, stroke, or heart disease avoid products that contribute to those diseases," says CSPI Executive Director Michael Jacobson. But don't expect to see new labels on the meat on your supermarket shelves anytime soon. A USDA spokeswoman tells the Wall Street Journal that the industry needs time to comment and comply. The earliest the rule could kick in would be January 2014, she says.